The double bill, Crying with Laughter by Bite Dance and Score 10 by Pickett Improv, at The Old Market theatre in Hove presents two pieces that ask similar questions from different perspectives about action and interaction in performance. 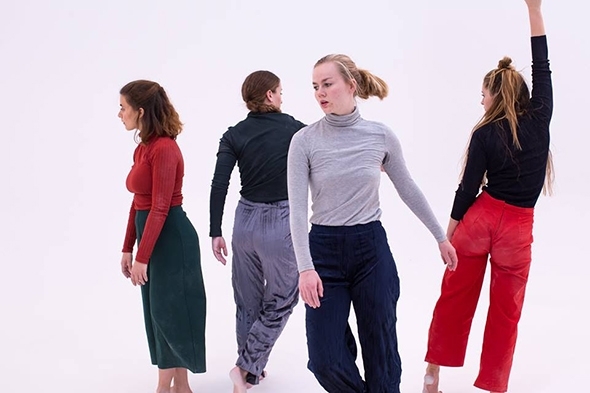 Zoë Bishop and Alice White do so by looking at physical comedy and laughter; director Hannah Pickett with dancers, Belinda Papavasiliou, Harley Ovens, Jessica Miller, Rosa Firbank and composer Iain Paxon, through sound and dance improvisation. Crying with Laughter opens with a black-and-white video of Bishop and White making exaggerated facial expressions inspired by the repertoire of Charlie Chaplin and Laurel & Hardy as they themselves sit on stage watching it with their backs to us, like giggling spectators at their own performance. At the end of the video, at the sound of bursting applause (far too loud) Bishop and White bow effusively to the audience. The enactment is reminiscent of vaudeville — a rather incongruous mixing of genres — to which the immaculate, matching costumes by Michelle Bristow also seem to allude. Bishop and White then sit again, this time facing us, to impart a gallery of silent gestures and postures of laughter that turn into laughing audibly at an invisible act in which we, the viewers, are implicit. This is the basic alternating structure of Crying with Laugher that Bishop and White repeat with small variations to crackly 78 recordings, including another video based on their slapstick. Towards the end the laughter veers into hysterical crying — the opposite poles of comedy and tragedy to which the title of the work refers. What is missing throughout this choreography of laughter and crying is the comic act itself, the situational context that is the galvanizing element between action and interaction, between the performer and the audience; without it, all that remains is a superficial focus on gestural mimicry. With their final dance routines there is a return to vaudeville where both Bishop and White appear more at ease; it is as if they are skating on the surface of the dark undercurrents of comedy without wanting to fall in, leaving them neither entirely in nor entirely out of its grasp. Pickett Improv’s Score 10 uses percussive and electric sound as the basis for the interactive improvisation both between Paxon and the dancers and among the dancers themselves. Arranged around a score of choreographic instructions, the dancers initiate or respond to each other’s movement, develop it or remove themselves from it in an alternation of duets, solos, and quartets. It’s a fascinating process to watch for like a five-way conversation made up of physical and spatial interventions and observations, nobody quite knows what the other is about to say nor how she is going to react. Paxon provides the percussive continuum, gently coaxing responses from the performers rather than dictating — apart from a couple of time cues — while the performers start and stop, enter or leave as they feel the desire to complete the current phrase. The art of improvisation is to join these phrases into a credible arc of communication over the whole work rather than making a series of independent expressions; to succeed requires experience and a marked physical and spatial intelligence (dance is, after all, a mode of thinking through the body). In this way the nature of Score 10 sets in motion a circular frequency that passes from Paxon’s percussion through the dancers and back, throwing up images and phrases that thrive on the very absence of narrative association to allow, when all goes well, for something organic to emerge between sound and movement. Miller and Firbank have the stronger ‘voices’, excelling at the compositional immediacy allowed by the improvisational structure while supporting and challenging the interventions of Papavasiliou and Ovens. Their familiarity with improvisation and with each other (as part of Swallowsfeet Collective) shows in their individual contributions and in their partnering. When Miller’s hand finds the semaphore equivalence of one of Paxon’s sounds, it seems so right it sets up an alternating rhythm that leads to a dynamic thrusting and resisting duet with Firbank like a heated argument that ends in smiles of complicity. By the end all four dancers are taking their improvisation for a walk with the freedom of familiarity and experiment. As an audience we enter this circulation of actions not so much by trying to figure out how much of the piece is improvised and how much is rehearsed, but rather by sharing the interactive flow of movement and sound. With Paxon’s final time cue the dancers begin to wind down, settling with a slow metronome mark to stillness and then silence.